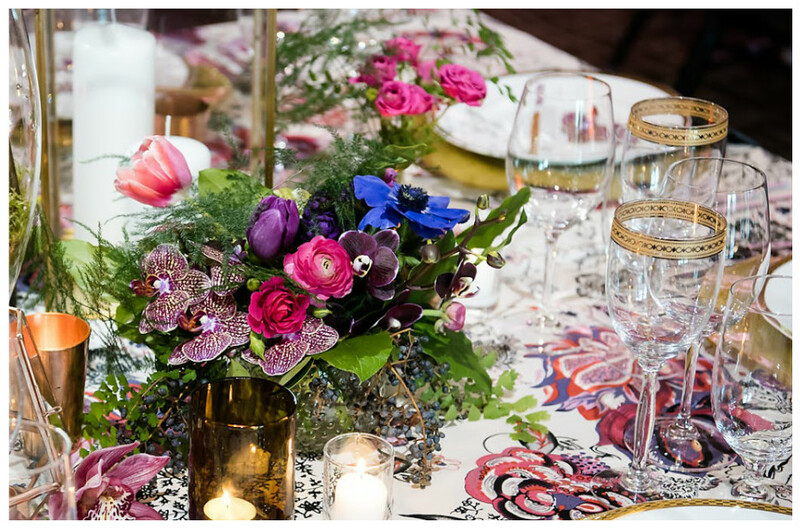 If you’re looking for modern ways to use bold patterns and prints at your event, you’ll love this tablescape. Plenty of color, texture, and luxury make this look memorable and fun. 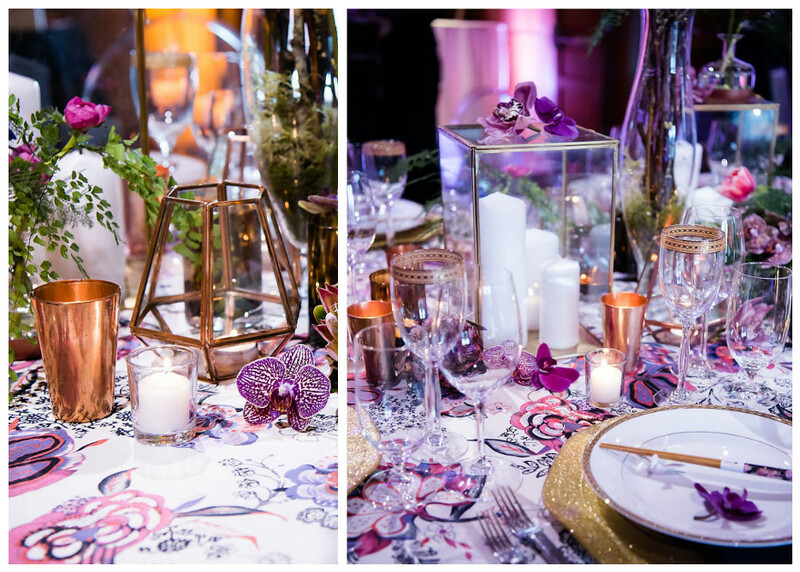 It features shades of pink and purple, with gold accents for added opulence. When guests arrive at this event, they’ll see there are plenty of interesting details to love. 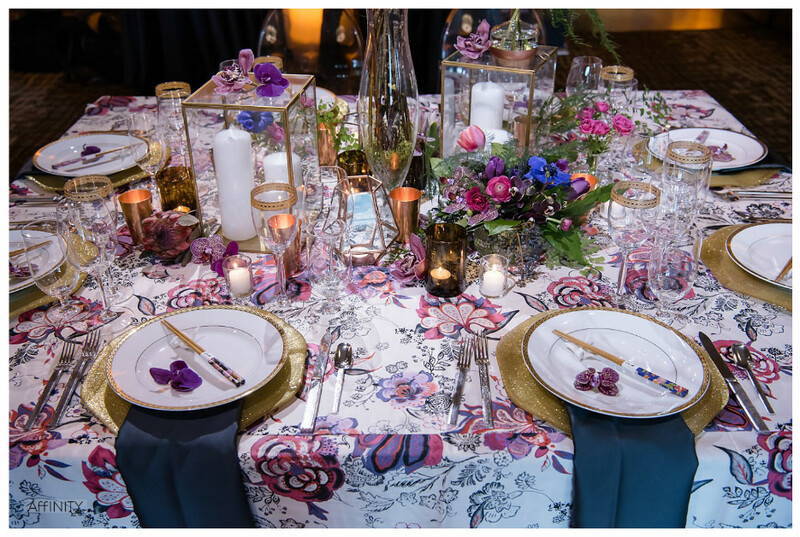 From copper drinking glasses to orchids at each seat, votives to patterned chopsticks, this tablescape has it all. When sitting down to eat, guests are greeted with deep purple napkins underneath glimmering gold charger plates. Alongside the flatware, event hosts have placed unique pairs of chopsticks at each plate for guests to use during the meal. They’re a perfect match for the floral centerpieces—shades of indigo, purple, fuchsia, and pink. And of course, the centerpieces pairs beautifully with the table linen. It’s a look that’s unlike anything you’ve experienced, and it’s perfect for an upscale gathering. The different elements of this theme pair perfectly together, and the ghost chairs at each table ensure that the décor truly shines. 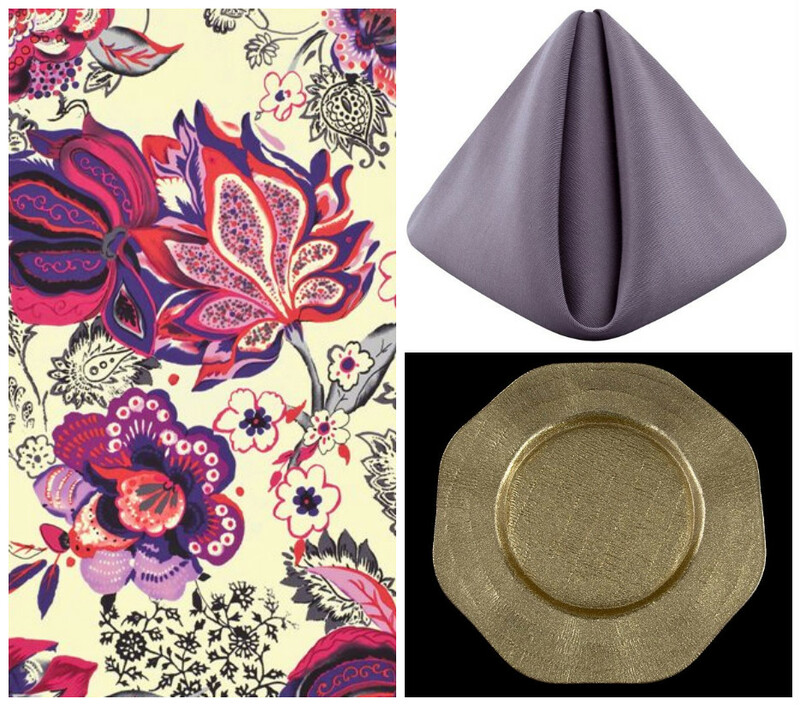 This look features Adele Lamour table linen, Purple Smoke Bengaline napkins, and the Octagon Gold charger plate. 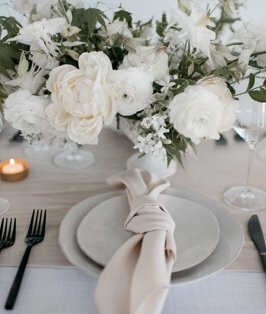 We love the way that candleholders and flowers feature similar smoky shades to the napkins. Glassware with shimmering gold rims add elegance and eye-catching elements. Everything together creates a cohesive, gorgeous look. Another unique aspect of this event’s décor that we love is the use of many different shapes and sizes for centerpieces. 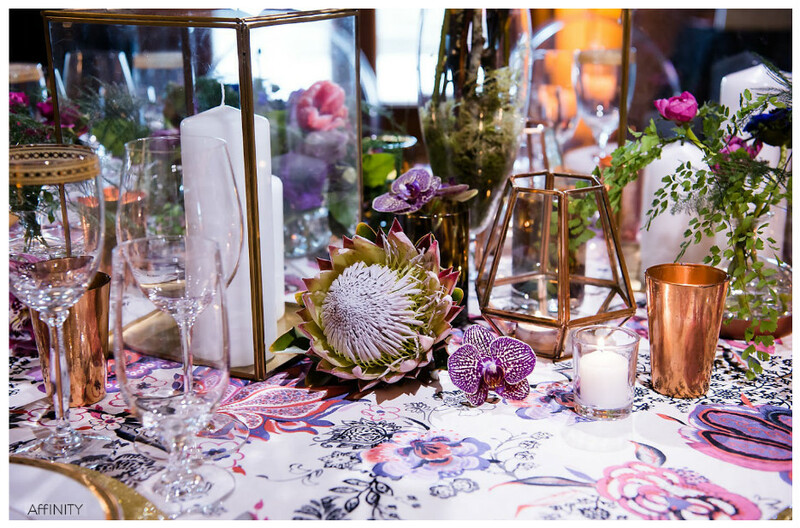 From single blooms placed directly on the table linen, to tall pillar candles within glass boxes to vases with a single stem in them, every glance you take in is different. 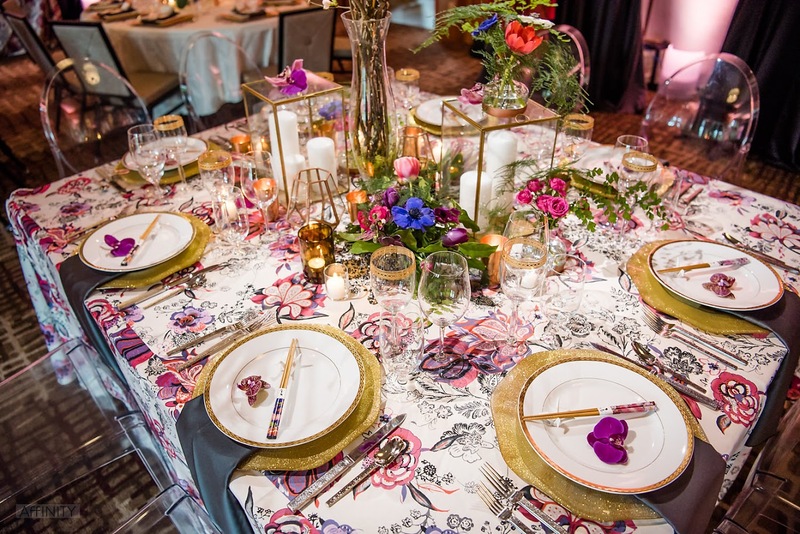 If you’ve been looking for a great way to incorporate bold patterns into event décor, this is the perfect inspiration. Show us how you’d decorate using bold prints—tag us in your photos on Instagram at @bbjlinen.